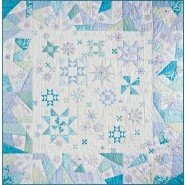 Frosty snowflakes fall softly across this scrappy 60.5" sq. quilt. Embroidery, crayon tinting, a traditionally pieced center and foundation paper pieced crazy block borders all come together when the snowflakes are iced with sparkling beads and crystals. The snowflake placement and beading are completely up to you the sky's the limit... a snowy sky Finished Size: 60.5" x 60.5".